The name of my blog should be a pretty big clue that I never need special excuses or reasons to bring a little sweetness into my life. But upon learning that October is also known as National Dessert Month, I decided an All-Dessert Party for grown-ups definitely needed to happen. If you’ve been looking for ideas to host your friends in a fun, low-key way, this is totally it! You do not need to spend days baking to prepare for this. Ask each of your guests to contribute a treat to the festivities. From brownies and cookies to more decadent layer cakes let each person bring his or her favorite. 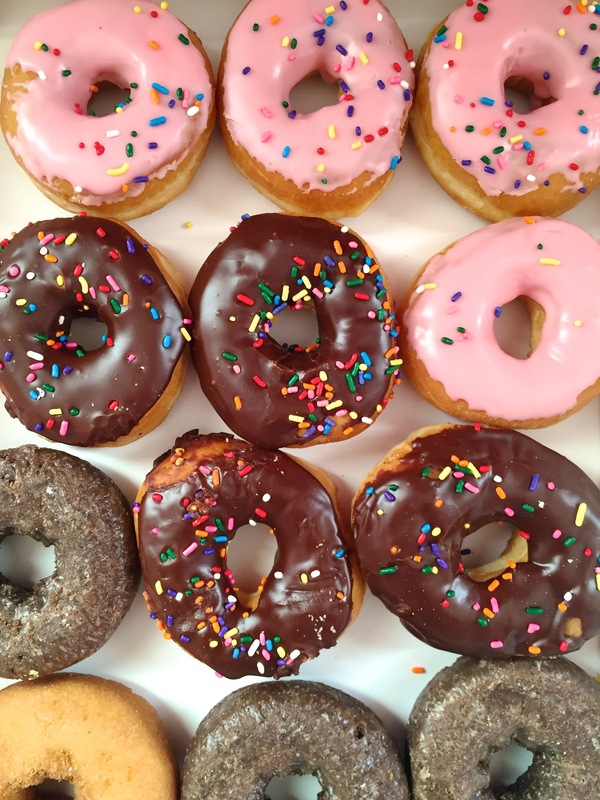 They don’t all need to be homemade either - prized treats from favorite local bakeries, a dozen donuts, or even a box of those store-bought chocolate cookies that everyone loves - it’s all delicious! And it’s all game. A simple table runner and some empty cake plates or stands to vary the height will help make room for all the sweets your friends bring. I love to add a few fun touches like handfuls of candy, marshmallows, or even rock candy straws to make things even more playful. 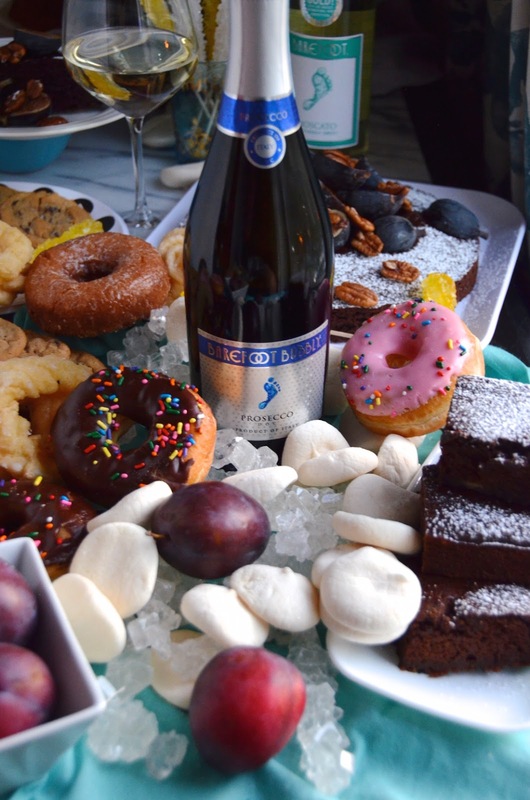 Pairing a variety of dishes is easy with glasses of sparkling Barefoot Bubbly Brut Cuvée. It’s festive and perfectly complements an array of flavors. And you can’t have a dessert party without crisp Barefoot Moscato - refreshing and the perfect amount of sweet. Be preemptive about leftovers by stocking-up on cardboard or aluminum takeaway boxes, which can be found at dollar or crafts stores. Make them available for guests to grab a few extra treats to take home at the end of the night. If your friends are the competitive type, think about turning the party into a friendly competition and asking guests to anonymously vote for their favorite dessert. All the votes go into a basket or jar on the buffet table, then are tallied up at the end. Send the winner home with a sweet prize like a cookbook or pretty ceramic cake plate. 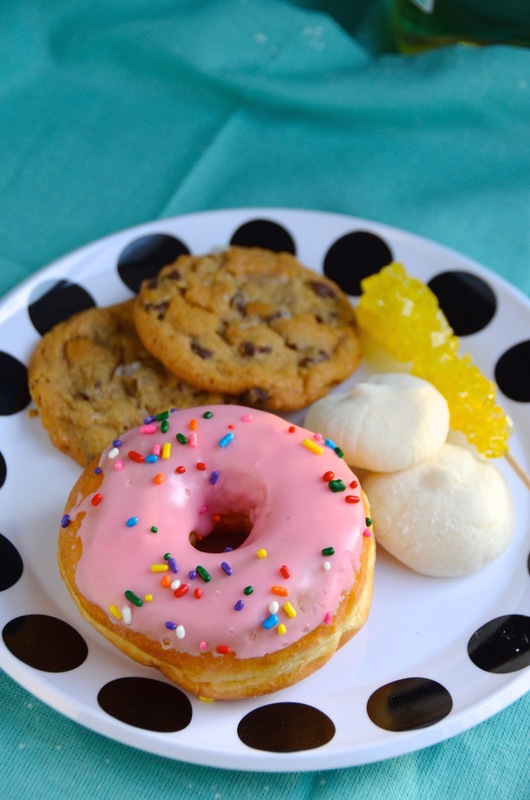 Can’t decide what to bake? 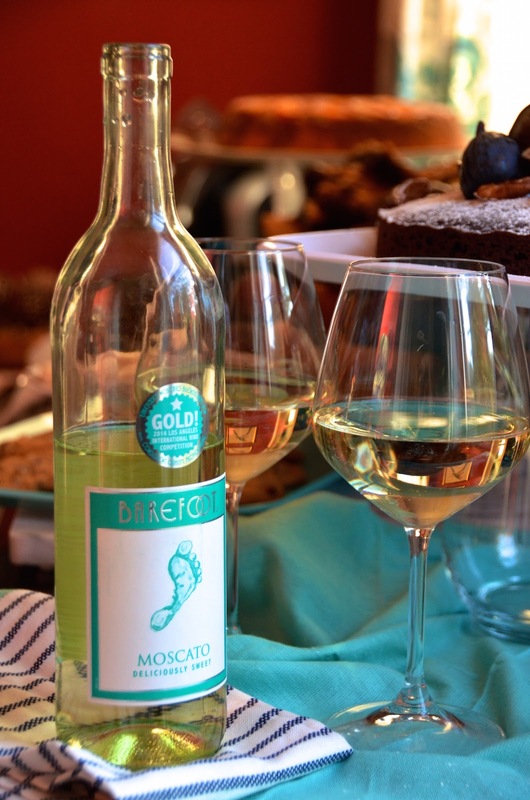 Try an easy Moscato Wine Cake! You can make the recipe by using just one bowl and it takes less than an hour from start to finish. And yes, there IS wine baked right into the cake. Amazing! Preheat oven to 350 F. Grease and flour one 10" Bundt pan. In medium bowl, combine all ingredients and beat with an electric mixer for about 4 minutes till batter is smooth. Pour into prepared Bundt pan and bake at 350 F for 50 minutes or until a toothpick inserted in the center comes out clean. Thanks to Barefoot Wine & Bubbly for sponsoring this post, and making it possible for me to keep creating new content and recipes for you! I was compensated for this post, but all ideas and opinions are my own. Please remember to always drink responsibly. For more ideas and information, visit BarefootWine.com.